I swear the world has gone mad! 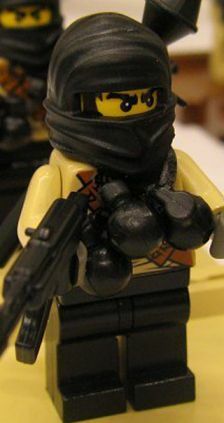 Lovely toy maker Will Chapman says: "It's not my intention to glorify terrorism or Nazis - but kids love the bad guys". 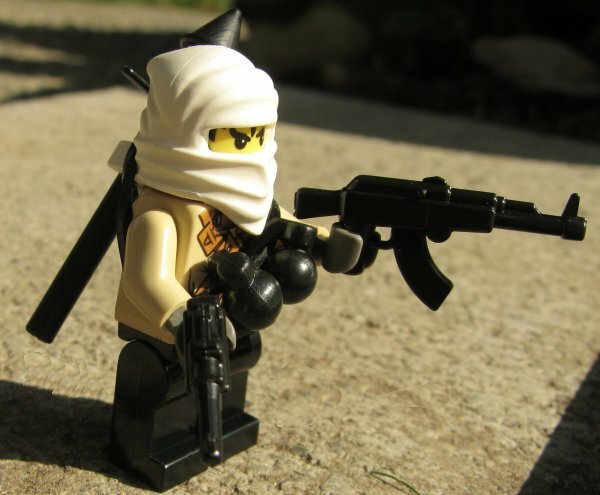 One of the children's toys - made from customised Lego men - resembles a masked follower of Osama bin Laden complete with a rocket launcher, assault rifle and grenades. 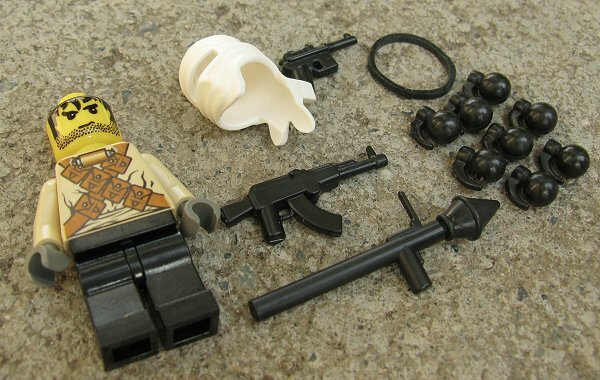 Another of the warped figures is a gun-wielding German major, whose uniform bears the SS insignia, which can be bought along with a replica Nazi stormtrooper. Brought to your children by BrickArms toy company! 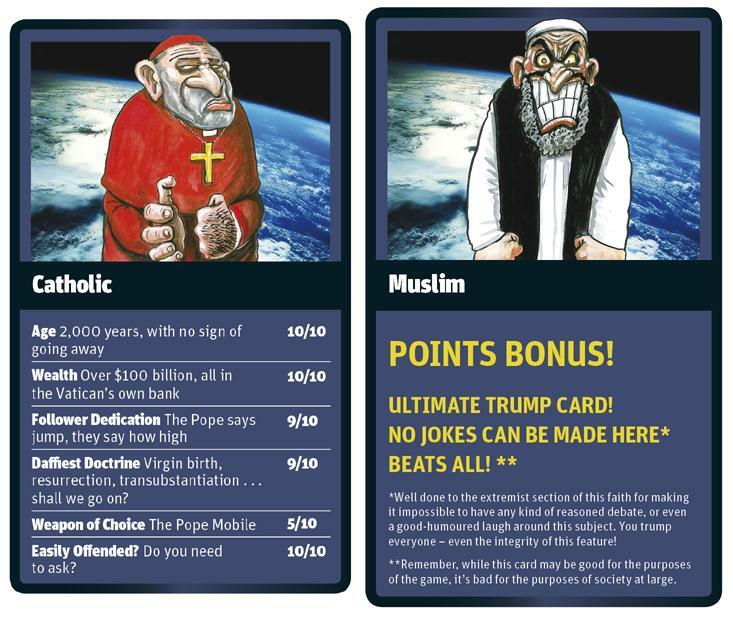 I would love to get my hands on this deck of cards, it's funny as hell! Somebody better not whine about it either or I'm gonna be pissed! A Japanese couple gets married in an online game while they don't know each other in "real life" (RL). The virtual marriage goes bad and the virtual husband divorces the virtual wife without giving her prior notice. The virtual wife then finds out about the virtual divorce and gets angry in RL. So then she decides to get even and kills the virtual husband in the online game. You'd think, so what? It's all virtual anyway, no one gets hurt in RL anyway. Virtual husband's RL feelings get hurt, so he files a RL police report against virtual wife. Virtual wife gets arrested in RL and now faces serious RL charges. Read entire article and find out how it all went down. TOKYO - A 43-year-old Japanese piano teacher's sudden divorce from her online husband in a virtual game world made her so angry that she logged on and killed his digital persona, police said Thursday. She used his identification and password to log onto popular interactive game "Maple Story" to carry out the virtual murder in mid-May, a police official in northern Sapporo City said on condition of anonymity, citing department policy. Najia is talking about hate sites schlepping up upon the US digital shores because if those sites were hosted in Europe a lot of people could be in jail. I was, at the time, cheerfully clicking on some links about Second Life and its European counterpart Habbo Hotel. The world of Snow Crash was nowhere near this seamy and litigious, all Hiro and YT had to worry about was a crazy Aleut with a nuke and an egomaniacal evangelist bent on unleashing the ultimate namshub upon the unsuspecting denizens of the Internet. What am I talking about you ask? Well first there is this 17-year-old youth from Holland who used various unethical means to secure access to other Habbo Hotel user accounts. He then proceeded to loot their accounts of virtual furniture, which he moved to his account. Total cost is estimated at $5,800US since to own stuff in Habbo Hotel requires the users to pay for it from credit cards. If stealing virtual furniture is not your game then in Second Life they just had their first S&L meltdown. Ginko Bank, after three years virutally open, has suddenly folded taking with it almost 200,000,000 Linden dollars or about $750,000 real US dollars. No word if the bank customers will get any of their money back from this online ponzi scheme. But if this ever goes to a virtual court, we can thank this case for blazing the way to establishing a virtual judicial system. One enterprising coder has created something to change the Ken&Barbie nueter avatars of Second Life into well developed figures. Leisure Suit Larry games spring to mind all of a sudden. Now he is suing someone for allegedly cracking his encryptions and peddling the SexGen code independent of the developer. To which the avatar in question replied, “So sue me.” No word on how Interpol or other international legal agreements will be impacted by this or vice versa. And to cover all of these less than legal activities it seems CNN has launched its own Second Life news bureau. No word on the quality of the reporting since anyone can submit stories, so I guess Capt Jamil Hussein and Balil Hussein might start working for SL-I Reports anytime soon; assuming neither meets the gallows in the meantime. There seems to be a growing market for Islamic video games lately and who knows, they might be THE answer to keeping rioters busy and off the street. The only drawback...they might produce even more future militants. 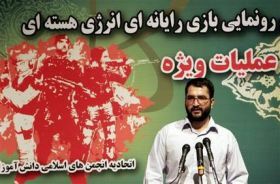 The Jawa Report: Terrorists Release "Training" Video Game: "Night of Bush Capturing"
World of Warcraft is about to generate more than 1 billion dollars this year. And while games stamped “Made in the U.S.A.” have often struggled abroad, especially in Asia, World of Warcraft has become the first truly global video-game hit since Pac-Man in the early 1980’s. One of the main reasons Western software companies of all kinds have had difficulty in Asia is that piracy is still rampant across the region. 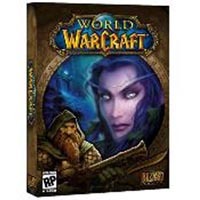 Games like World of Warcraft circumvent that problem by giving the software away free and then charging for the game service, either hourly or monthly. You can play the game here if you like http://www.darfurisdying.com/, but I think it's lame. Sure I feel bad about what's happening to the innocent people in Darfur, but I think the liberal media's latest attention to the Dafur crisis is nothing but a ploy to feed on people's emotions while making the Bush administration look evil. Darfur is not America's responsibility. In the online game Darfur Is Dying, launched at Sunday's Save Darfur rally in Washington, atrocity is a click of a mouse away. A player can be a 14-year- old girl in a blue dress with white polka dots named Elham, in search of water for her camp, chased by gun-carrying Janjaweed militiamen. Run, Elham, run! The Moroccan model living in Bethnal Green, London, Karima Adebibe, was selected by Edios, the world's leading developers and publishers of entertainment software, to represent the video game Tomb Raider's hero Lara Croft, reported Tombraiderchronicles.com. Karima Adebibe is the 7th model to portray Lara Croft after the Dutch actress, Jill De Jong.